I’m extremely honored to have been nominated by Katrina Burroughs for the Perrier-Jouët Arts Salon Prize 2015. In Mid March, The Salon members, Guided by Tony Chambers, Chair of the Perrier-Jouët Arts Salon for 2014 and Editor-in-Chief of Wallpaper, will select an emerging talent in Contemporary Craft who’s at the beginning of their professional career. “Launched in January 2013, the concept of the Perrier-Jouët Arts Salon stems from the origins of the Salon in Paris from the mid-1700s, bringing together like-minded people under the roof of an inspiring host to refine tastes, muse on the Arts, inspire and increase knowledge through conversation. The Perrier-Jouët Arts Salon brings to life the original spirit of the Salon, drawing together an eclectic and dynamic group of members to share ideas and debate on developments in the Arts, with a philanthropic goal at its heart. The Salon supports the selection of an annual prize winner who receives a substantial sum and experiences to support him/her in the development of their career. I’m keeping my fingers crossed!!!!!!!! 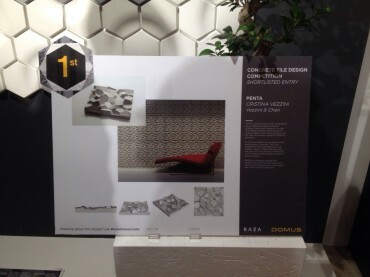 I’m thrilled to announce that Penta just won DOMUS- KAZA Concrete tile design competition. PENTA is a modular wall tile that consist of irregular polygon and angles of varying heights creating a sense of depth and texture. Its vibrant, geometric finish entertains the eye with a multitude of light and dark reflections that create layered pattern similar to a natural scenery and crystal formations. The tile will now go into production and be sold at Domus alongside other beautiful KAZA Concrete wall covering. The PENTA tiles will be unveiled during Clerkenwell Design Week in May.